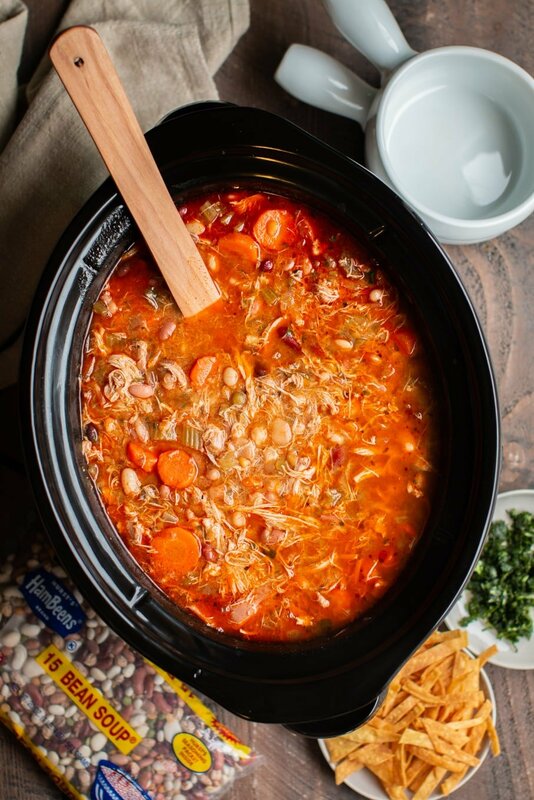 Slow Cooker 15 Bean Buffalo Chicken Soup is spicy and hearty. A great meal for game day! Sponsored by Hurst’sⓇ Hambeen’sⓇ 15 Bean SoupⓇ, though all opinions are mine alone. Hello! I have a new recipe for you to try for game day. 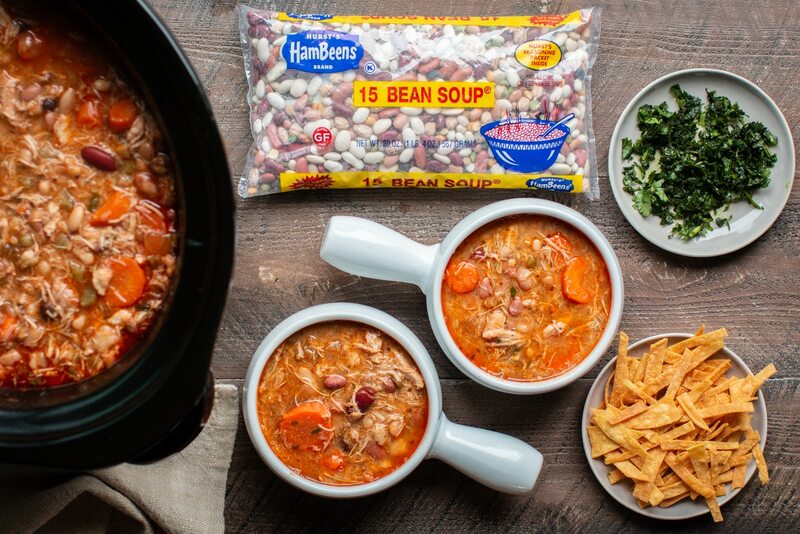 It has all the expected flavors you’d want for game day but with a unique twist, 15 bean soup mix! As you may know I’ve been busy the last few month creating recipes for Hurst’sⓇ HamBeensⓇ and am happy that I’ve signed up to do a few more. 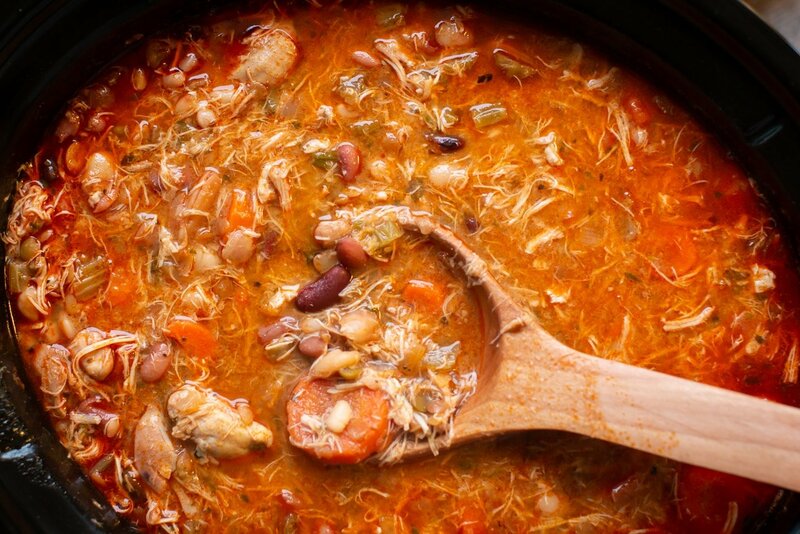 This recipe has been one of my favorites, I love anything spicy and I love how the chicken thighs help flavor the broth of this soup. I’ve been really lucky to find this soup mix at my local Walmart and Fred Meyers. If you want to check where to pick up this soup mix, you can look here. I served this soup with homemade tortilla strips. I made those by cutting up corn tortillas and frying them in hot oil. This soup is on the spicy side, to cool it down serve with a dollop of sour cream. 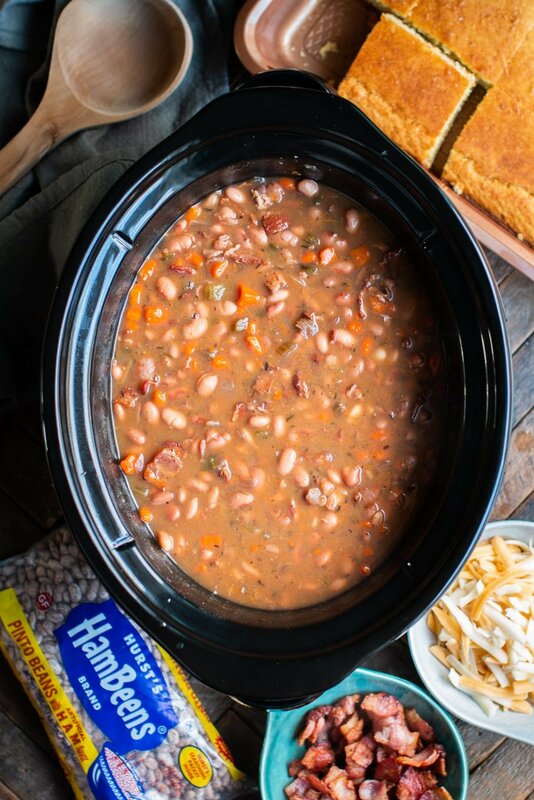 If you love this 15 bean recipe and want to see more like this you can find them at Hurst’s Hambeens. 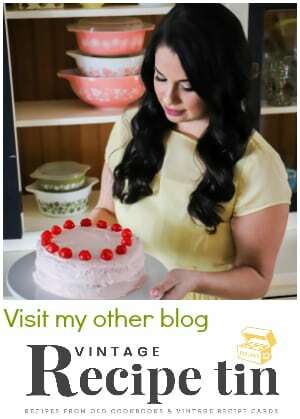 I hope you enjoy this recipe and have a great weekend. Rinse and sort beans, discarding any debris. We won't be using the ham flavor packet for this recipe, you can save it for another recipe if desired. Add the rinsed and sorted beans to the slow cooker. Add the chicken, onion, celery, carrots, garlic powder, onion powder, oregano, pepper, buffalo sauce, chicken broth to the slow cooker, stir. Add the bay leaf on top. Cover and cook on HIGH for 7 hours without opening the lid during the cooking time. When the cooking time is up, remove the bay leaf. Remove the chicken thighs onto a plate and shred them with two forks. Add the shredded chicken to the slow cooker. Add the minced cilantro and stir. Serve with tortilla chips or homemade tortilla strips. Enjoy! 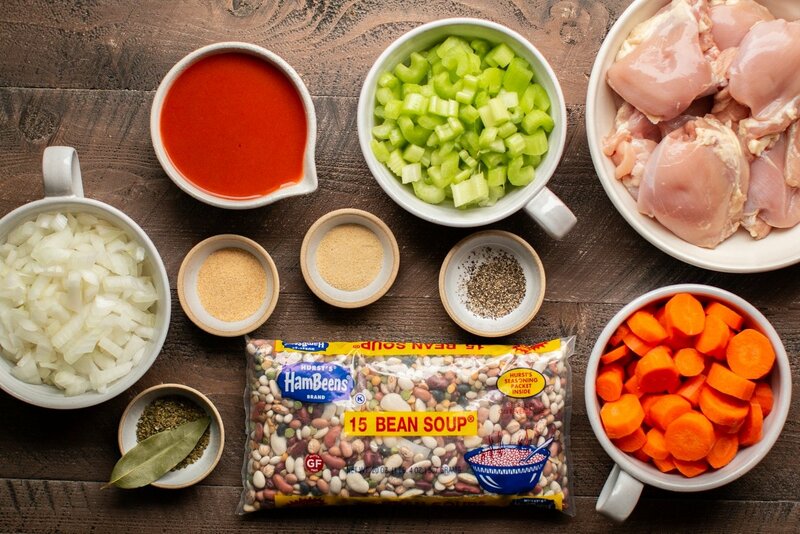 This recipe is sponsored by Hurst’s Hambeens 15 Bean Soup, though all opinions are mine alone. Hi! If I am wanting to make this but I can’t find the 15 bean soup locally, what could I substitute? Sometimes you may need to check the Spanish area for the 15 beans soup. I think any combo of dried black beans, pinto beans, etc would work. Just need to know how many cups of dried beans are in this package. I am going to try this that way- just ordered some Rancho Gordo heirloom beans and this will be my first use for them! This recipes looks perfect! It’s a 20 ounce bag of beans, so if my math is correct I figure 2 1/2 cups of beans should do it. You can add less or add it slowly at the end. Yes, it’s pretty spicy. 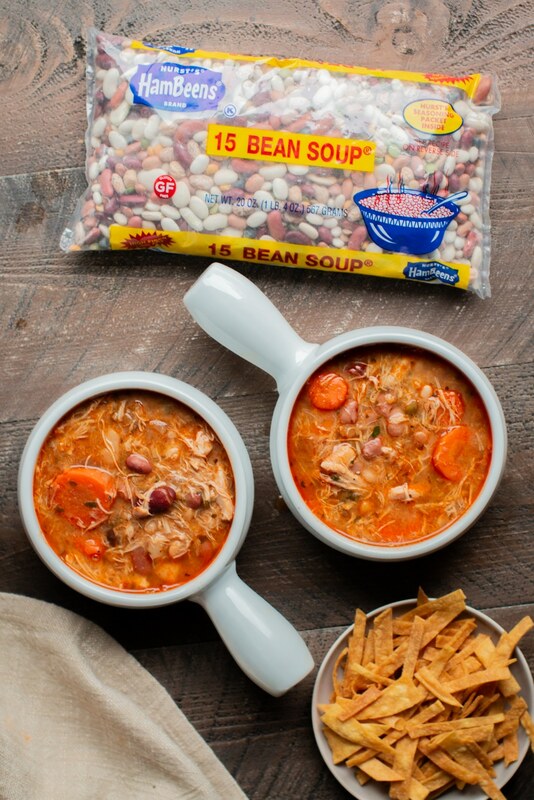 Walmart usually has the 15 bean soup shown in video. On the bag of beans it said to soak overnight..Don’t have to with this recipe? Hi! No, you do not have to. 🙂 Works just fine. The bean company suggested for me to try this way without soaking and I will never do it again! Cooking on high works great, no soaking required. Made it today, this was beyond amazing!! Great to hear Shannon, we loved it too! Could you use boneless chicken instead of chicken thighs. Nobody likes it ? Breasts? Yes, that would work just fine. Making the 15 bean buffalo chicken soup today & wonder where you get your recipe portions from – mine are filling up the crock pot way more than yours on the video does – I could only get 5 cups of broth in with the one cup of buffalo sauce – my 3 carrots, 3 stalks of celery & one onion look like so much more than yours on the video and I am using the largest oval crock pot made…. 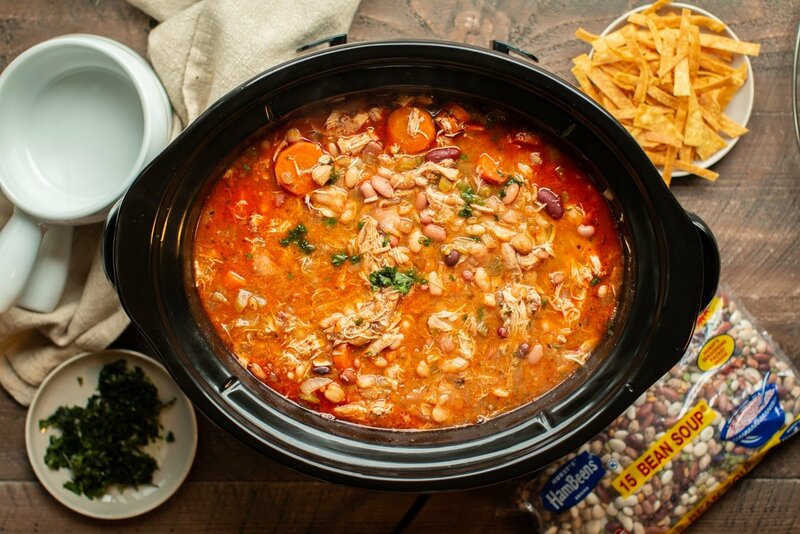 You’re slow cooker may be smaller than you think. There are slow cookers that are a 4-quart oval. I used a 6 quart. 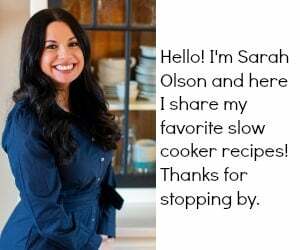 I have a 4 quart slow cooker. Is there an adapted recipe? You could cut it in half, this recipe as is makes a very full 6 quart. What if I cook it on low? How many hours do I cook it for?? I would do about 10 hours. 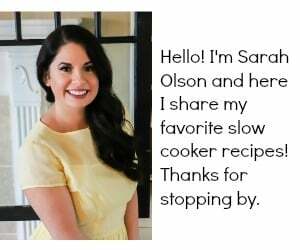 Has anyone tried this recipe using an instant pot? If so, how long did you cook it for? Is this very spicy? Wondering if it would work for my kid. It’s very spicy 🙂 Could make with out the buffalo sauce and add a bit to the adults portion. I made this on the stove top using canned cannellini beans and the same ingredients listed in the recipe. And it came out great! Delicious! How much cannellini beans did you use? I know this is going to sound crazy but I hate beans of any kind (incl peas – anything round!) but the rest of the recipe sounds fabulous. How can I use the recipe then? Add more carrots? Any other veggies? Do I need to reduce the cooking time? Please help. I would cut down on the liquid a bit and the buffalo sauce. You could add more carrots or even potatoes. If I cut the recipe in half, would the cooking time still be the same….7 hours or less time? What does it mean to sort the beans? Might be a stupid question but I didn’t understand the sorting after rinsing. I did not presoak and did the video with the beans. Maybe you didn’t cook them long enough? Suspect this will not get posted but…..after reading the comments above and looking at the pictures, tried this recipe. Beans were crunchy, even after soaking the beans for 36 hours and cooking on low for 2 x 10 hours on low, in a brand new Slow Cooker! Only tasted the hot Sauce even with only 1/2 cup used! So disappointed. This is the first time to have ever commented on a recipe! This is not a Presoak recipe. Soaking beans that long they start to ferment. Your slow cooker may be broken if you cooked them for 20 hours and they still aren’t tender. I’m sorry this didn’t work got you. @GB. 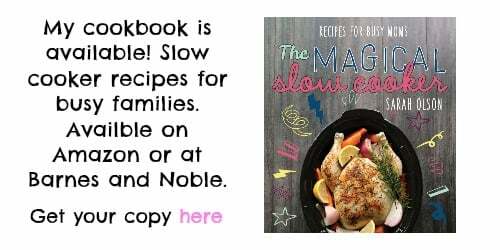 Wow something has to be wrong with your slow cooker. I just made this recipe yesterday and my oldest son and I are still talking about. I followed everything to the exact. I was worried about the soaking of the beans as well. I soaked them in cold water for about 1 hour, placed all the ingredients and cooked for about 7 1/2 hours…..DELICIOUS!!!! Adding to my favorites!! !